For years, I've been searching for a less-toxic deodorant for my husband. My husband has gone along with most of my green upgrades pretty willingly, but he insists on having a deodorant that is up to the task, and so far the less-toxic deodorants have largely not worked for my husband. Now I am willing to let a thing or two slide here and there, but I did not let go of my quest for a new deodorant for my husband for one major reason: he often sleeps with our kids, and after they sleep together, I can smell the fragrance of his deodorant on my kids. Which means the fragrance is on them. So what's wrong with fragrance? The problem with fragrance is that the term "fragrance" is the mother of all loop-holes in ingredient disclosure. Fragrance is a trade secret, so manufacturers don't have to disclose what's in it. Independent testing of fragrance products by Environmental Working Group demonstrated that some individual products literally hide 24 different chemicals under the name "fragrance," and those chemicals are often members of the infamous phthalates family. I would have settled for a conventional deodorant for my husband if it just didn't have "fragrance" listed as an ingredient. But I couldn't find one. 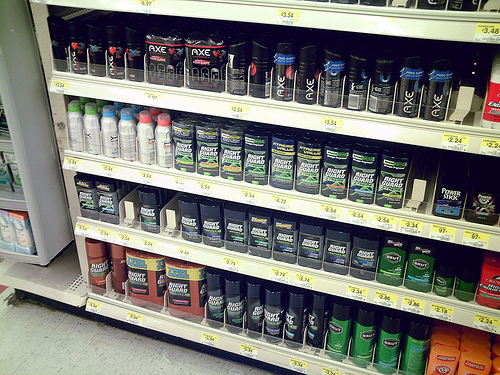 I once walked the aisles of Target looking at every single deodorant for men, and not one was without the ingredient "fragrance" (except the Tom's of Maine brand, which Target does carry). Tom’s of Maine. This has been my deodorant of choice for several years, but it did not provide enough odor control for my husband. A couple of my sisters have not found it to be effective enough either. Tom’s of Maine Roll-on. My husband tried this one too, but no dice. Hugo Naturals. I found promising online reviews about this one, and Hugo’s is the deodorant that my sister finally settled on, but it wasn’t good enough for my husband. Burt’s Bees. I think my husband rejected this one based on smell. I can’t remember. I know that I returned it before he even tried it. Crystal Stick. One of the favorites of the natural set, I had high hopes for this one. And it did seem to work for my husband on certain days. But when it was especially warm or he had to give a presentation, it wasn’t enough. For a while, he would use the Crystal Rock on weekends and some work days, but fall back on his old Speed Stick when it really counted. Crystal Rock does utilize aluminum salts, so if you feel strongly about avoiding aluminum all together in all its forms, this one isn’t for you. Also, you need to wet the “rock” before use, which some might find annoying. A female friend of mine just puts it on right out of the shower when her armpits are still a little damp. She also told me that there was a little adjustment period before she felt like it was really working and when she felt pretty stinky. So if you are switching to a less-toxic alternative from a conventional antiperspirant, give your body a little time to adjust. At Long Last. A Winner. Crystal Body Roll-on. Although the Crystal stick failed when it mattered most, I decided to get the Roll-on version for my husband to try, mainly because I found it for next to nothing on Amazon. And guess what? It works! After a long day of work on a hot day, my husband still smells great. Goodbye, forever, Speed Stick, along with your poopy fragrance. What is your favorite natural deodorant? I'm so glad to read this! Thank you! I used to make my own deodorant out of coconut oil and tea tree oil, but suddenly it really stopped working, and I was rank all the time. So I reluctantly switched back to the nasty stuff, but I'd love to give it up. Your link goes to an amazon search, is there one particular brand that you found works the best? I changed the link in the post. But you might want to search Amazon to see if they have it for a better price -- there are usually multiple listings. We have not tried the scented ones. The biggest problem I had with natural deodorants is that they all seemed to leave my armpits with a icky, sticky feeling if the weather temperature crept up or if nerves struck. Then I started using Nutressant a couple years ago and whoah, amazing. No sweat! It's definitely different than conventional deodorant because you apply it with your fingers and the product get melty when it gets hot (but it still works, just don't spill it). I also like that it's stored in a glass jar, not a plastic container. My aunt sells Nutressant body products that she and her husband make, at farmer's markets around Kansas City. But they can ship, too. Here's a link for the deodorant: http://www.facebook.com/photo.php?fbid=138133659599526&set=a.127508400662052.32469.127040237375535&type=3&theater. And for ingredients list: http://www.facebook.com/NUTRESSANT?sk=info. I agree with her that everyone should be able to buy soaps and deodorants from their farmer's market, but I just haven't found anything locally that I like as much as Nutressant, particularly the deodorant. I have so wanted to use a natural deodorant but haven't found any that have been effective. I really don't like fragrance for several reasons but I do have a drawer full of stuff that I've bought that didn't work. My husband likes Herban Cowboy in Musk. Manly scent and seems to be (mostly) effective! Thanks for this! My husband's skin was freaking out from the deodorant he was using (Tom's), so I suggested the crystal one and it's been working great! Trade Joe's Cotton unscented. I'm a big sweaty guy and it lasts all day. No chemicals. No odor. My husband and I both use baking soda on hot days, nothing on others- our bodies may have taken a little while to adjust but we've both found we don't need it. We wear a lot of wool (think icebreaker not knitted jerseys) which also helps a lot. Natures Gate works wonders, It also lats a long time. I would suggest for a man that they try rubbing a little virgin coconut oil under their arms and sprinkle with a little bit of burts bees 100% natural baby powder. I rub virgin coconut oil under my arms and sprinkle with a little bit of burt's bees 100% natural deodorant. I decided to switch from antiperspirant (I know, I know). I hate sweating, though, and I really hate stinking. My sister found some posts about Soapwalla deodorant cream, and I have to say, it is AWESOME. I sweat about the same amount as I did with antiperspirant. It uses lavender, peppermint and tea tree oils. The woman who makes it also has a lot of other natural products on her website. I have heard of soapwalla and heard good things about it. She is on Etsy too. How lovely that you found something that works well for you. Perhaps I will have to give this one a try.